The good thing was that I did some deals, Reebok and some others, before, so I already had a house before I signed. I was more situated than a lot of people. I miss the locker room, nothing else about [football]. The locker room is unique. Different than anything in any sport. You got 53 people in there, Type-A personalities. I remember my first time ever putting on a helmet. I signed the night before, I was late. I was a 21-day holdout, and they signed me at 2 in the morning, but we had a game that Thursday at 7. They told me, "hey, we aren’t going to play you." Now I’m a rookie. This is the third preseason camp. The night before, I’m signing my contract. They told me, "we’re just going to put a helmet on you to let the fans see you." They put me in the game! 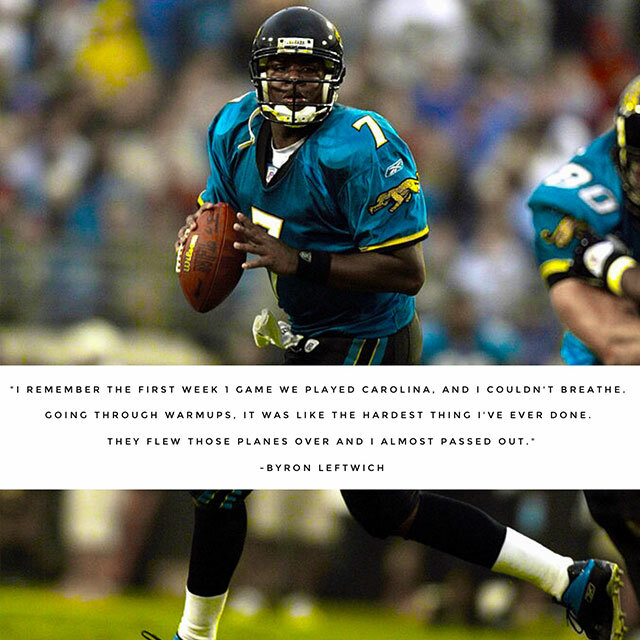 I remember my first week 1 game we played Carolina, I couldn’t breathe. Going through the warmups, it was like the hardest thing I ever did. From there it got better, I just remember being in pregame warmups, and they flew those planes over and I almost passed out. I knew they were going to have me hold out once I had good OTAs, and you don’t want a QB controversy. If I’m not there I can’t play, and I knew they were robbing people with contracts, the guys before me, so they needed to do me right. I held out 21 days, me and Willis McGahee, only two holdouts in the first round. We were talking to each other the day before and were like, 'man, where you at?' He’s in Miami and we’re the only two and I’m like, 'how did we get here' … and he’s like, “man I got 2 tickets to an award show in Miami!” I was on my way there and my agent was like, "no, fly to JAX." So I flew there.